The public sector net borrowing numbers showed a surplus in January, a month when the government receives a significant proportion of its tax receipts. With those receipts higher than expected and economic growth stronger than expected, the government earned more than it spent to the tune of £9.4bn. Taking a year to date comparison, these are the best borrowing numbers the government has achieved since the financial crisis. A little bit of that roof has been fixed, and the sun is still shining. Mr Hammond is now likely to undershoot his end of year deficit target by £10bn, borrowing less over the year, around £60bn, than the Office for Budget Responsibility expected last autumn. Though it should be remembered that target was significantly loosened following the referendum result. On the surface, a £10bn undershoot may appear good news, and is likely to lead to calls that the Treasury could loosen the public spending purse strings. The chancellor could spread a bit of salve on that toxic issue of the day - business rate increases due in April which are leaving some firms with significantly higher bills - and still hit his deficit target. Business rate relief could be made more generous and transition periods extended so that any abrupt increases are put on a smoother trajectory. Which might be good politically. And Mr Hammond could offer something for the National Health Service and social care. Which might also be good politically. 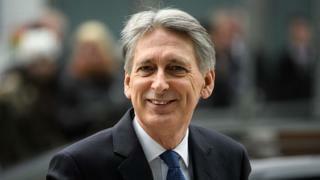 But, Mr Hammond does not want to be a "political chancellor" in the style of one George Osborne, moving rapidly to plug political holes with Treasury gold. And January's strong numbers have been flattered by the recent sale of government shares in Lloyds Bank and the fact that self-assessment receipts from individual tax returns have come in earlier this year compared to last. The chancellor has set himself two tasks ahead of the next general election. Prove that the Treasury is the nation's cautious chief financial officer, focused on "balancing the books" and reducing the deficit (the amount the government spends over the amount it earns) to zero. And second, reboot the economy by improving private sector growth with a focus on productivity and infrastructure spending. In Mr Hammond's mind, one month's good figures do not change that sober to-do list.